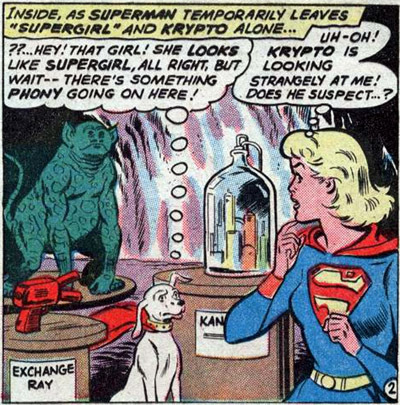 Krypto shows up in a multi-issue Supergirl story, just in time to act as a Doggie ex Machina. The story so far: The evil Kandorian scientist Lesla-Lar has switched places with Supergirl thanks to their uncanny resemblance (once again, we find the Kryptonian gene pool is rather shallow). Kara is inside the bottle city, powerless, with amnesia, acting in a Supergirl movie, while Lesla is brought to the Fortress of Solitude to get sniffed by Krypto. He knows something is up. The nose always knows. Well, a super-dog can do a lot, like operate the machinery that allows people to go to and from the city. Oh look, Krypto even caused the accident that will likely restore her memory. And smugly, he goes back to space, Superman never knowing Supergirl was ever an impostor. 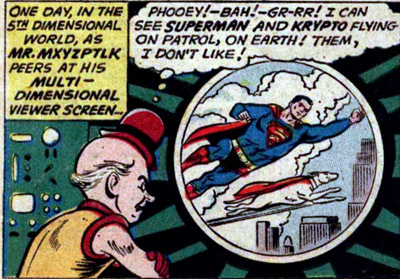 Mr. Mxyzptlk hates Krypto just as much as he hates Superman. 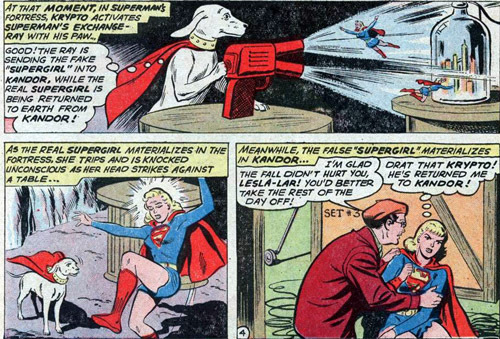 But the super-pooch isn't in the story any more than that, so Mxyz' revenge will have to wait for another day. What couldn't Krypto do? It's such a shame he never bred, show us what HIS gene pool is made of. It's likely that Kryptonians were also well ahead of us when it came to controlling pet overpopulation. Bkowing up your entire planet seems an extreme way of keeping the number of strays down. One Panel #72-74: New Superhero? DCAU #217: It's a Super Life! DCAU #215: Misery in Space! DCAU #214: Something Wicked This Way Comes! DCAU #212: Speak Now... or Forever Rest in Peace! DCAU #208: You Can't Cheetah an Honest Man! DCAU #205: Clark Kent, You're a Nobody! DCAU #203: Stop the Presses! RPG Talk: I Want to Play a Space Elf!